There is a certain peaceful pleasure in creating funeral flowers as a last gift from a loved person. 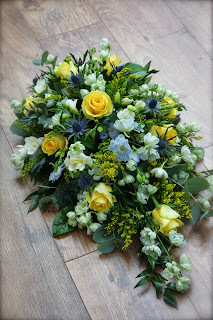 This single ended spray was created using pale blue Delphiniums, blue eryngium, yellow roses, white freesia and solidago. A fitting fair well for a loved gentleman.